St. Jude Medical, Inc. (NYSE:STJ), a global medical device company, today announced the ILUMIEN III trial met its primary endpoint demonstrating percutaneous coronary intervention (PCI) guided by optical coherence tomography (OCT) to be superior to angiography in stent expansion and procedural success and non-inferior to intravascular ultrasound (IVUS) guided-PCI in post-procedure minimal stent area (MSA). Results from the ILUMIEN III study were presented today in the first Late Breaking Clinical Trial session of the Transcatheter Cardiovascular Therapeutics (TCT) Conference in Washington, D.C. The study enrolled 450 patients at 29 sites in eight countries. It is the first multicenter, prospective, randomized, controlled study to date comparing OCT-guided, IVUS- guided and angiography-guided PCI outcomes. Is superior to IVUS-guided PCI at detecting predictors of major adverse events (major stent malapposition and dissection). "These results provide further evidence of the importance of imaging in PCI procedures," said Dr. Ziad A. Ali, associate director of translational medicine at the Columbia University Medical Center's Center for Interventional Vascular Therapy and a principal investigator of the ILUMIEN III study. "Minimal stent area is widely considered the most important factor for circumventing both early and late major cardiovascular events. Now we know that OCT-guided PCI achieves similar MSA results to IVUS-guided PCI and results in significantly greater stent expansion to angiography." During PCI procedures, physicians use diagnostic imaging to make decisions related to stent sizing and to assess how to best keep the artery expanded to restore blood flow to the heart. A key factor in reducing stent failure is increasing the MSA and securing appropriate stent expansion during PCI to restore blood flow, a process commonly known as revascularization. In the ILUMIEN III study, physicians employed the St. Jude Medical™ OPTIS™ Integrated and ILUMIEN™ OPTIS™ PCI optimization systems, along with the Dragonfly™ imaging catheters designed for high-resolution imaging, to assess vessel and lesion characteristics, size stents, and optimize stent placement in patients randomized to OCT-guided stent implantation. "These results demonstrate that OCT is an important imaging option to achieve optimal stent deployment to advance the care of patients with coronary artery disease," said Philip Ebeling, vice president and chief technology officer at St. Jude Medical. "Optical coherence tomography has a superior resolution to detect predictors that can contribute to major adverse events and thus can facilitate the treatment of those conditions, if necessary, to minimize the likelihood of their occurrence." Next year, St. Jude Medical plans to expand research that demonstrates the long term value of OCT further. "It gives me great pleasure to announce that St. Jude Medical recently committed to sponsoring the ILUMIEN IV study, a global multicenter trial that will evaluate long term outcomes in patients randomized to angiography-guided PCI alone versus angiography and OCT-guided PCI," said Dr. Gregg W. Stone, professor of medicine at Columbia University, director of cardiovascular research and education at the Center for Interventional Vascular Therapy at New York Presbyterian Hospital/Columbia University Medical Center and co-director of medical research and Education at the Cardiovascular Research Foundation (CRF). "We will provide more information as it becomes available in the coming weeks and look forward to initiating this trial in 2017." The St. Jude Medical OCT technology is an intravascular imaging tool that uses light to provide anatomical images of disease morphology and automated measurements. 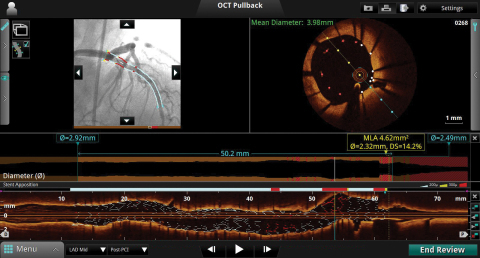 With OCT technology, physicians can visualize and measure important vessel characteristics that are otherwise not visible or difficult to assess with older imaging technologies. As a result, OCT can provide automated, highly accurate measurements that can help guide stent selection and deployment and assess stent placement to help ensure successful procedures. Learn more about how the OPTIS™ Integrated system works.